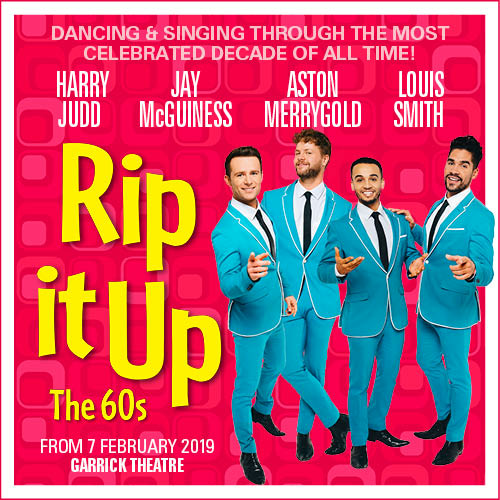 The ultimate strictly spin-off boy band will be bringing the swinging 60’s smashing into 2019 in an explosion of song, dance, acrobatics, and amazing visuals! Aston Merrygold (JLS) and Jay McGuiness (The Wanted) sing, Harry Judd (McFly) is on drums, and Olympic champion Louis Smith performs amazing gymnastic feats. But what shines through the most in this spectacular show is the fab four’s phenomenal dancing talent! They are joined by an incredible cast of dancers, singers, and musicians, celebrating the iconic sounds, sights, and events of the decade which transformed the world. Featuring songs by legends who shook a generation, including The Beatles, The Rolling Stones, The Who, The Beach Boys, The Byrds, The Doors, Burt Bacharach, Elvis Presley, Bob Dylan, Aretha Franklin, James Brown, Marvin Gaye, Stevie Wonder, and many more. With film footage from the era and a host of other visual delights, the show celebrates everything there is to love about the 60’s - with a bang! Book your tickets for Rip It Up today.